Until Friday Night is the story of a struggling boy. To everyone who knows him, West Ashby has always been that guy: the cocky, popular, way-too-handsome-for-his-own-good football god who led Lawton High to the state championships. But while West may be Big Man on Campus on the outside, on the inside he’s battling the grief that comes with watching his father slowly die of cancer. This book made me relive all those sad, painful memories of losing someone to a terminal desease. When we read, we do so to escape, to learn and to feel. Good things. This book served the exact opposite purpose. I know 'sickness sells', brutal as this sounds, but I wish I had protected myself from the unnecessary pain this story evoked. As for the romance, it should have felt sweet, healing and heart-warming, and it did some times. 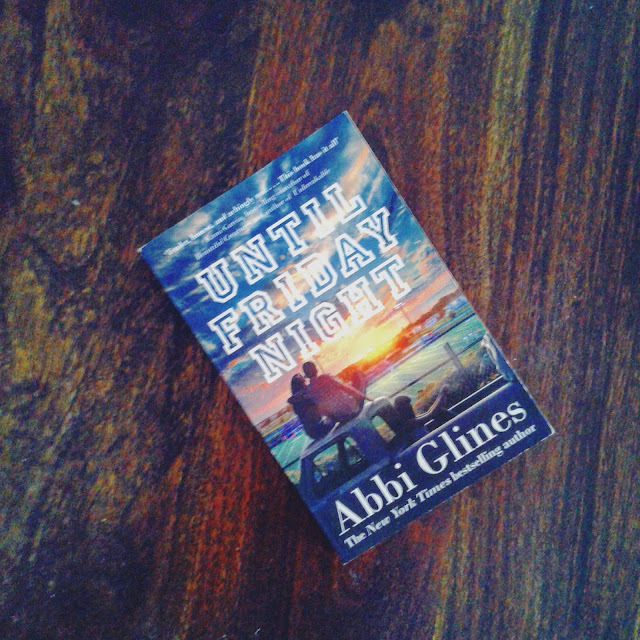 That's what I love about Abbi Glines. But two broken people can't fix each other. That's a law of nature. I totally understand why an author would want to explore the brokenness some people have to go through and conquer, and I think she wanted to give out a message of hope in the end. But the thing is, unless you have been through such a situation yourself and dealt with it, and unless writing about it comes from a deep, personal place inside, while seeking redemption -and ideally finding it as you create art- you can't give such a painful story with a positive message. It will end up being depressing, hopeless and pointless. It will end up hurting and disrespecting those whose reality this has been. It's not cute. It's my life. Please don't treat it as entertainment. It can be done tastefully, of course. I have read so many books that have helped me during these past, nightmarish years. But I can smell it when someone isn't writing from personal experience. From miles away. Keep yourselves safe while you read. Also, have you read this book? What did you think? Do you get where I'm coming from? Please leave me a comment, I'd love to talk.